I saw an interesting report that a few people in a conference room can quickly result in CO₂ levels such that there is impaired decision making. Wow. 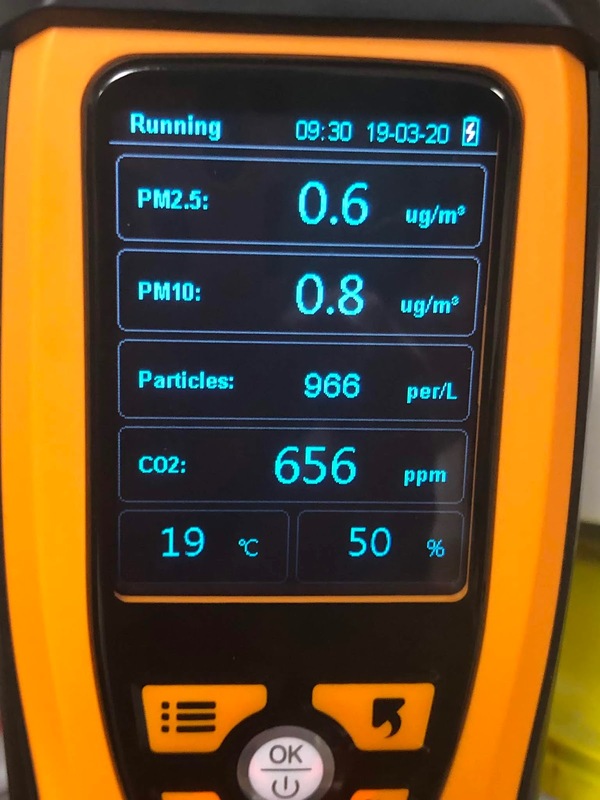 So I thought, I wonder what CO₂ levels I work in normally. Of course a good start is understanding what CO₂ levels are sensible. Wikipedia has some answers. 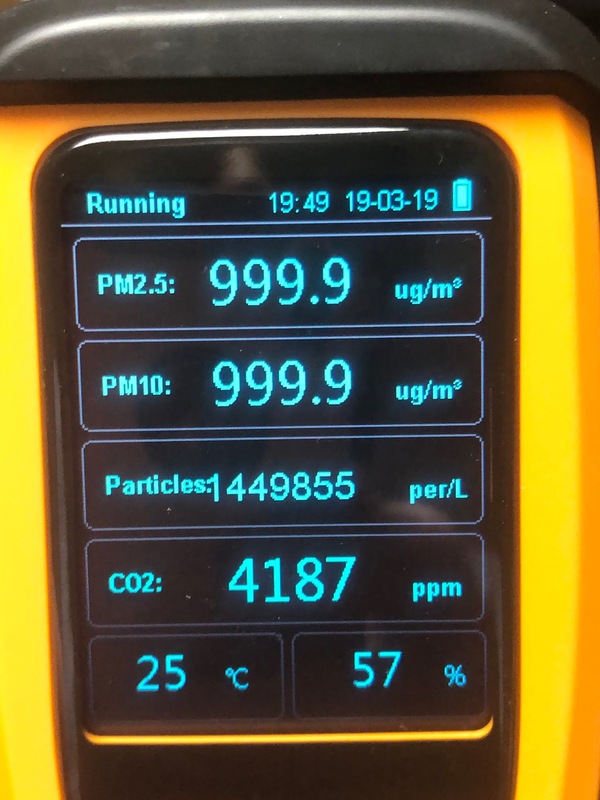 It seems below 1000 ppm is acceptable, but there safety levels set way higher than that. I went and got a meter off Amazon (where else!). It seems to be easy to use, and gives two particulate values and a CO₂ value as well as temperature and humidity. This is a small room, under 5m x 5m, with windows (that I keep closed), two doors (also closed most of the time) and no air vents as such. 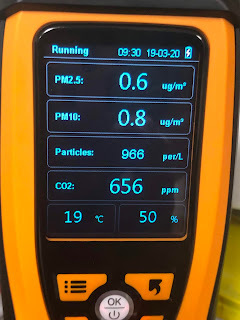 It has air-con which seems to filter quite well, so the day starts with this - very low particulates and sensible CO₂ well under 1000 ppm. It is only myself in the room normally though. Once I am in here a while, CO₂ gets to over 900, but it depends what I am doing. I have a treadmill - if I use that then the CO₂ gets over 1000 in a few minutes. So maybe I don't need extra ventilation in here - if I open a window when using treadmill perhaps. This time of year a window is not problem but in summer or winter it is not ideal, obviously. For reference, outside this morning varied between 520 to 560 as I walked through town to Tesco for my Costa breakfast. At Costa it was 700 ppm, and particulate levels of 3. Impressive. Where next - well, my bedroom. I have air-conditioning in there as well, and as such do not normally have a window open. The bathroom has a window slightly open but the door to bedroom is normally closed. I was quite surprised that during the night the levels were over 1300. I suspect I do need some ventilation! I tried a window but it is behind curtains and did not result in much in the way of extra air circulation or a noticeable drop in CO₂! I also checked the office, which was around 1200. They have a fan but normally off, so I think we can improve working conditions there. I also wonder what a plant or two would do. Do I really need to do anything? I am thinking a bit more ventilation perhaps in some cases, maybe. In practice, I am planning to install some almost silent low power alternating external air vent/fans with heat exchangers. I'll report back on how well they work in due course. Assuming I improve the CO₂ levels I won't be able to say if that makes any difference as no real objective way to tell without huge biases creeping in, I don't think. 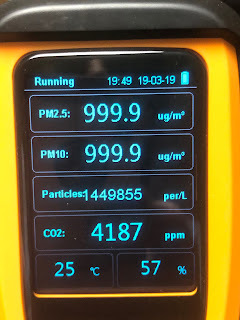 That was impressive - particulate meters literally off the scale (100 is a level that is bad), and CO₂ at silly levels. And yes, I do like my gadgets. The opening paragraph explains a lot. Put 650 in a chamber together and they can't make any decision. Fascinating little gizmo, could have hours of fun with that thing. Out of interest, how do people manage to sleep OK in small bedrooms with closed doors? Why does the oxygen not run out? The room leaks, basically. But small bedrooms (like student accommodation) can see pretty high CO2 levels after they've been occupied for a while. > Why does the oxygen not run out? I assume because the room isn't actually air tight. The oxygen is very unlikely to run out. The CO2 would rise to toxic levels long before that happened, and you'd die of extreme respiratory acidosis :) the fact that this almost never happens suggests that airflow levels almost everywhere people live are high enough to prevent it, since rooms are indeed rarely airtight -- also, you'd wake up with a blinding headache and panting like mad long before, and it would be bleeding obvious that something was wrong, indeed you'd probably be in a state of panic and dashing out of there as fast as your legs could carry you. Acidosis is *unpleasant*. I don't know who drew the pretty graph on that chap's twitter post, but ASHRAE have never had an 'acceptable limit' of 1000ppm, and 1400 would be a pretty stiff target to meet in very many situations involving more than a few people in a room. Is there a CO2 meter that supports SNMP?